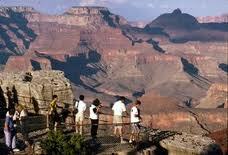 A new Arizona Republic report summarizes the various development pressures affecting the Grand Canyon. While much of the canyon remains a magnificent wilderness, even those areas can suffer from noise and light pollution. Now plans for an extensive resort development in the gateway town of Tusayan threaten the canyon water table, as detailed by the New York Times. 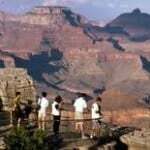 The development would threaten the Grand Canyon’s last rating, which had risen to an encouraging 66 in the 2009 NG Traveler stewardship survey. The danger is akin to other cases of excessive, unplanned hotel development damaging water tables elsewhere in the world, with consequences. In Siem Reap, Thailand, the overtapped water table endangers the foundations of Angkor temples. In the porous limestone of the “Maya Riviera” in Quintana Roo, Mexico, development has reportedly polluted the water table linked to the famed cenotes. All three areas involve World Heritage sites. This entry was posted in All, Stewardship and tagged Grand Canyon, stewardship, sustainable development, Tourtellot, World Heritage by Jonathan Tourtellot. Bookmark the permalink.